Throughout the Pleistocene epoch, extending back over the 2.6 million year time interval preceding the Holocene, the ​Heart of Avalonia region was predominantly a glacial region. However, the Pleistocene epoch was punctuated with several relatively brief warm periods, or interglacials. The most recent interglacial, the Holocene, remains in progress at the present time and was defined to have terminated the Pleistocene. Several methods have been developed to determine the paleoclimate of the earth and its various regions and to assign dates to past climatic fluctuations. The climatic events under consideration in these Frost-heaved Bedrock Field Observations are constrained to be relatively recent events, since sequential episodes of glaciation erase most of the geomorphic evidence of prior glacial episodes. Given the constraint that only recent (late Pleistocene) events are to be taken under consideration, one of the most effective means for establishing a climate event timeline is to use data from temperature vs. time studies based on analysis of stable (non-radioactive) isotopes. Stable isotope analysis utilizes deviations in concentrations of particular stable isotopes from normal concentrations found near the earth's surface. Of particular utility for paleoclimate studies are the stable isotopes oxygen-18 and hydrogen-2 (deuterium, D) both of which are found in low concentrations in water. Water is normally comprised of one atom of oxygen-16 and two atoms of hydrogen-1. When, by chance, a water molecule contains one of the rare heavy isotopes (oxygen-18 or deuterium), then the molecule is heavier than normal and is thus slower to evaporate from the liquid and quicker to condense from the vapor. Variations in stable isotope concentrations in both biologically produced and abiotic materials can be used for paleoclimate studies. Any material to be studied needs a complimentary method to determine its age, and in biological materials this method is often radiocarbon dating. However, sometimes other methods such as counting annual cycles can be more precise. A good example of this is found when wood is dated by counting growth rings. ​Ice cores drilled from long-term persistent glaciers provide an excellent source of data for stable isotope analysis in paleoclimate studies. As moist air approaches a glacial region, water condenses along the way, preferentially depleting the remaining vapor of its molecules containing oxygen-18 or deuterium. The vapor that eventually precipitates as snow over a glacier is then measurably deficient in the heavier isotopes. This deficiency is preserved in ice as the snow compacts and converts to glacial ice. Furthermore, the heavier-isotope deficiency is temperature-dependent, with colder weather yielding a greater deficiency. 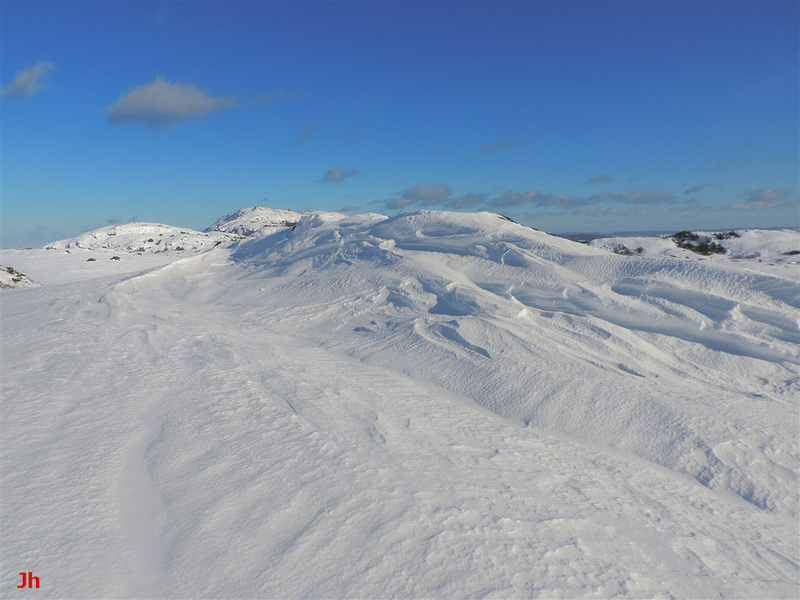 Annual cycles can be counted in ice cores when the summer-winter temperature difference produces seasonal variations in heavy-isotope deficiencies. Several deep cores have been drilled in Antarctica and Greenland, these penetrating through kilometers of ice and reaching bedrock. The Greenland ice cores (DYE-3, GRIP, GISP2, NGRIP) are particularly useful for analyzing climate fluctuations in the northern hemisphere. Cores drilled in central Greenland have yielded data with countable annual cycles extending back almost 10,000 years. Further analysis of ice flow patterns has made it possible to infer climate data back more than 100,000 years. The above chart uses data from a variety of sources, mainly ice core data, to reconstruct episodes of glaciation and deglaciation of Heart of Avalonia. The time axes indicate thousands of years before present. The blue zones cover time intervals where the temperature is low enough to suggest that the region would be under ice cover, while the green zones indicate probable ice-free intervals. Note that there is no temperature scale on the chart. Direct measurements of paleoclimate data specific to the Heart of Avalonia region were not available. The chart thus contains an implicit assumption that paleoclimate data from Greenland, and, for the earlier times, Antarctica, is reflective of Newfoundland local data, at least in a proportional sense. Contrary to what is shown in the chart, it is quite likely that some of the warmer intervals appearing between -800ka and -400ka also deglaciated Newfoundland, analogous to the warm intervals after -400ka. 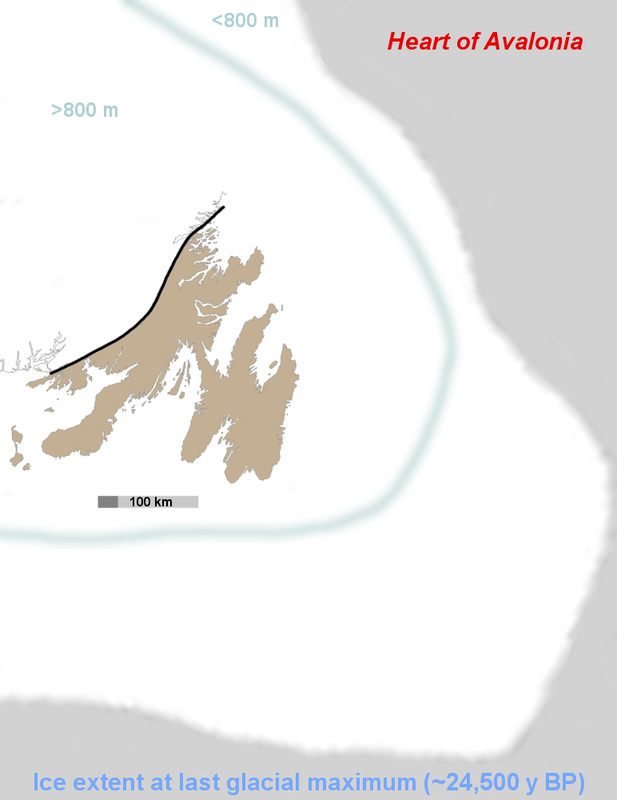 The multiple episodes of glaciation and deglaciation during the Pleistocene have eroded and flattened the topography of Newfoundland, leaving the highest hill on the island at a height of 800 m and most of the hills in the Heart of Avalonia region at under 300 m. The geomorphology of the area is dominated by the impact of past glaciation. 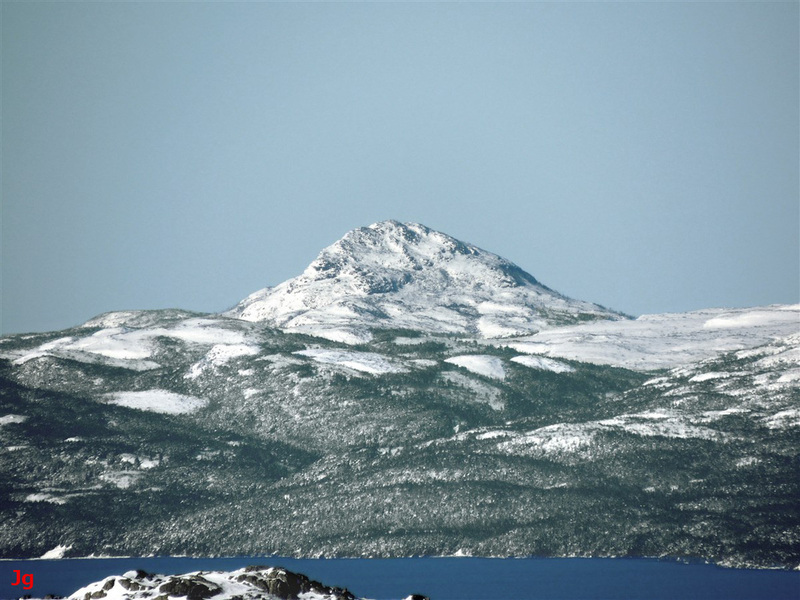 The hill shown in the first (left) photo above, (Centre Hill, just north of the Isthmus of Avalon) is almost 340 m high (above sea level) and was over-topped by recent glaciation. Abundant erratics from an easy-to-recognize diorite occurrance about 8 km west of the hill are found at all levels on the hill, including the top. The second (right) hill shown (Butter Pot, eastern Avalon) is just under 300 m high. This hill shows the obvious impact of streamlining by basal-slip glacial erosion and is plucked on the far side, making this feature a roche moutonnee. The last time period before the Holocene that Newfoundland was ice-free occurred during the Eemian interglacial, this warm interval starting about 130,000 years ago and lasting about 10,000 years. The Eemian climate appears to have been somewhat warmer than today's climate. Following the Eemian, the Wisconsin glacial stage left Newfoundland under deep ice cover for about 110,000 years. During the Wisconsin, the Laurentide ice sheet advanced southward from the Arctic to cover much of eastern North America. 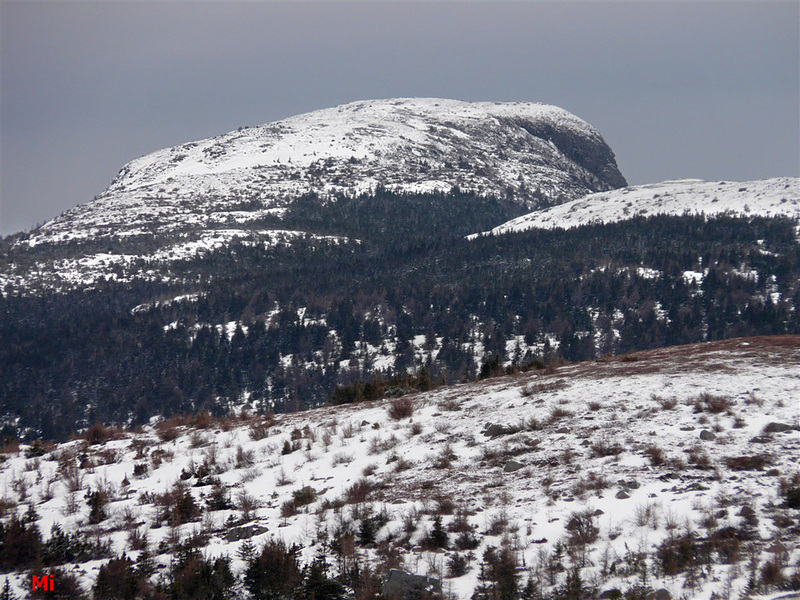 Simultaneous with the advance of the Laurentide ice sheet, glaciers developed on the main part of the Island of Newfoundland and, independently, on the Avalon Peninsula. The map below depicts centers of ice development in the Heart of Avalonia region. The potential significance of local ice centers in terms of bedrock erosion is discussed in Regional Glaciation. As the Wisconsin glacial stage progressed toward its maximum extent of ice development, the Laurentide continental ice sheet merged with the individual Newfoundland ice sheets yielding a single unbroken ice sheet extending over the entire Island of Newfoundland and reaching out onto the continental shelf (sea level was about 120 m lower than present during LGM). The illustration below shows the extent of ice cover at the last glacial maximum. Following the last glacial maximum, the climate of Heart of Avalonia began to warm, leading ultimately to complete deglaciation of the region. It is this process of deglaciation and the accompanying climatic conditions that are the focus of this set of Frost-heaved Bedrock Field Observations. The timeline chart shown below illustrates the major phases of deglaciation. As shown in the timeline above, the climate changes associated with deglaciation were not monotonic, but rather were punctuated with warming periods followed by relapses back into colder conditions. Many factors influence climate and some of these factors involve feedback loops, either positive or negative. Negative feedback loops tend to stabilize climate while positive feedback loops cause accelerated change. A good example of a positive feedback loop is the albedo change accompanying deglaciation, whereby deglaciated bedrock absorbs more heat from the sun than does ice cover. Thus partially deglaciated rock accelerates its own continuing deglaciation. Other more complex feedback loops involve atmospheric composition (methane, carbon dioxide), prevailing winds, cloud cover, amounts of precipitation and changes in ocean temperature and ocean circulation patterns. Sometimes climate change is gradual, occurring over centuries or millennia, but ice core analysis indicates that abrupt climate change, occurring over time frames of decades, is also part of the record. Abrupt climate change can result from external forcing such as volcanic eruptions, impact events or sudden changes in ocean circulation patterns. Abrupt climate change might also reflect the action of positive feedback loops accelerating trends that were initially gradual. Pollen studies have shown that the Avalon Peninsula supported plant growth 10100 years ago and hence that deglaciation was complete or well under way a few centuries before that. It is probably safe to assume that the region was entirely under ice cover until the commencement of the Bolling interstadial about 14700 years ago. The time interval from 14700 years before present to 10400 years before present thus becomes the interval during which deglaciation of Heart of Avalonia took place. Multiple episodes of abrupt climate change may have occurred within this 4300 year interval. In particular, the entry into the Younger Dryas stadial (12900 Ybp) and the exit from the Younger Dryas (11700 Ybp) appear to have involved abrupt climate change. Nunataks are areas of unglaciated rock that occur in otherwise glaciated regions and are usually associated with the tops of higher-elevation features. During deglaciation, nunataks can form or grow as ice cover moves from being continuous to being sporadic. With fluctuations in climatic conditions, glaciers that were initially in retreat can re-advance for a time. 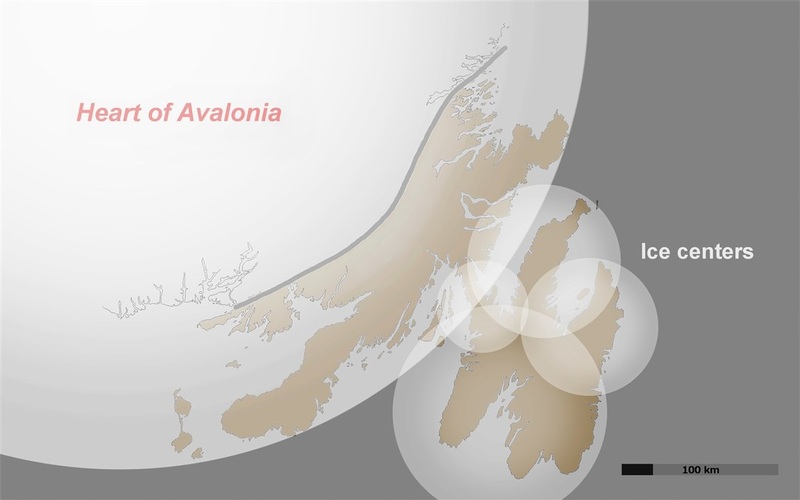 It must be assumed that sometime during the 4300 year deglaciation time interval, areas of Heart of Avalonia were free of ice cover, but were in close proximity to glaciated areas. The timing of this interval of mottled glaciation of the region could be critical in understanding the geomorphic features remaining after complete deglaciation. In particular, did significant areas of unglaciated bedrock experience the intense periglacial climate conditions of the Younger Dryas, or was the whole of Heart of Avalonia under ice during the whole of the YD stadial? If some bedrock areas were exposed during part or all of the Younger Dryas, then these areas may have been impacted by abrupt climate change and hence by the dynamic thermal environment that abrupt climate change would entail. See Regional Glaciation and Polar Desert). The present day climate of Heart of Avalonia​ can be described as a cool, temperate maritime climate. The average annual temperature is about 5 deg. C, with midsummer temperatures averaging 15 deg. C and midwinter temperatures averaging about -5 deg. C. Prevailing winds are westerly to southwesterly in summer and westerly in winter. The region receives an average annual precipitation of about 1500 mm of rain-equivalent, 22% of this as snow and 78% as rain. A winter scene, hinting at a glacial past, is shown below.